Discover Montreal from a bird's-eye view on this thrilling, 30-minute zipline experience. Try the first urban zipline circuit in Canada. Climb the Montreal Clock Tower, fly like a superhero across 1,200 feet of biplane, and enjoy a spectacular view over the Old Port of Montreal. A safety briefing and a souvenir photo of the aerial stunt are included. 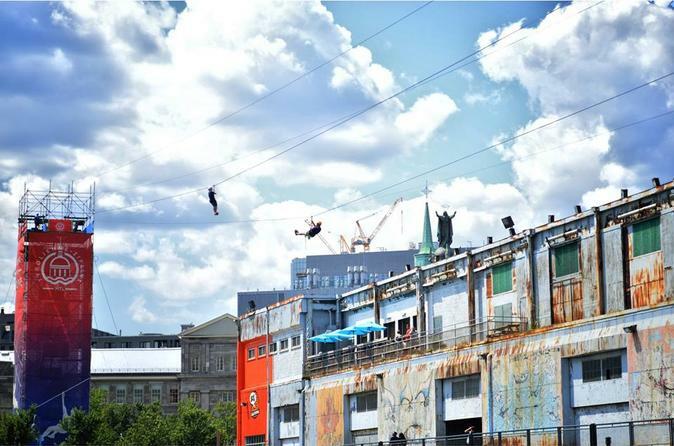 This 30-minute zipline adventure begins at the Montreal Clock Tower Pier in the Old-Port of Montreal. Start by climbing an 85-foot-tall tower that offers a breathtaking view of downtown Montreal. After taking a few pictures and selfies from the top of the tower, the ziplining instructor will go over all the safety rules and procedures to ensure the utmost security. The zipline set consists of two ziplines (cables) that are side by side. This provides the opportunity to enjoy and share the experience with another person at the same time. Please dress appropriately for the weather. It's recommended to wear shoes and comfortable clothes. Once cleared for take off, secure the harness to the 1200-foot-long zipline and prepare for a great flight. At the end of the activity, there will be a free picture of the experience ready to share via social media. This 30-minute zipline adventure is a great activity for both thrill seekers and the entire family alike.